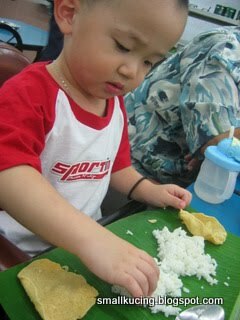 A fortnight ago, we went to eat Banana Leaf Rice at Kanna Curry House, Jalan Gasing after Ah Kong's medical check-up. Uiks....everyone is using their fingers. I also wanna use fingers la. 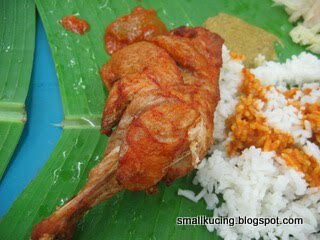 Mamarazzi's order Ayam Goreng. Taste not that good. The meat was "lembik"
Nice fish eggs but rather expensive at RM5/plate. 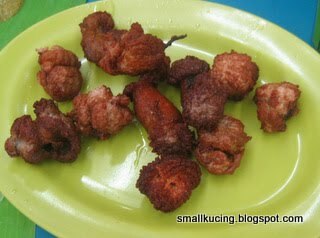 got minced fish/tuna ball goreng or not? indian shop one very nice. hope ah kong's medical is all clear! ohooh.. i love that ikan telur... long time i didnt take mamak food..or indian curry.. pedas, pedas! He he he, nice to eat with our hands at curry house! Long time never had Indian food. Small Kucing ate too mcuh until kena bayar? 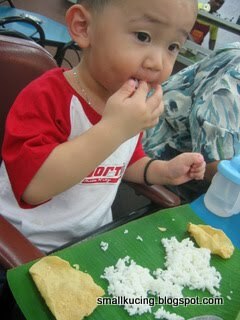 I thought shared the food with daddy and mummy only. 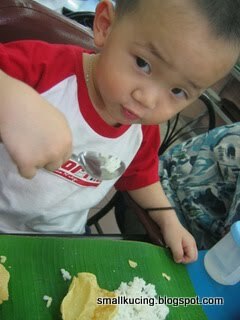 I love banana leaf...but I will ask for fork and spoon, dunno how to use my hands. I love the Telur ikan too. after eating the curry can feel very sleepy one wor...weird.. Eating with fingers does taste the best. I enjoy doing so. memang more expensive la the fish eggs... i love telur ikan too... yummy! iI I'm not mistaken, this Jln Gasing place is considered posh area, that's why everything also charge one.